An air cleaner s-tube connects the exhaust manifold heat shield to the air cleaner snorkel, allowing air heated by the exhaust manifold to flow into the air cleaner. Ford identified s-tubes using basic part number 9652. The 428 CJ s-tube is serviced through part number C8AZ-9652-A. 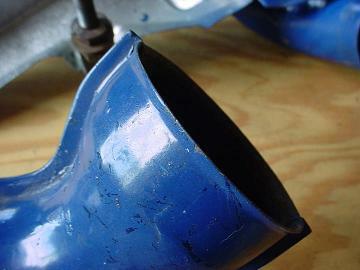 These stamped-steel tubes are painted Ford Corporate Blue and are made from two sheets of formed metal that is pinched together along both sides of the tube. The larger upper opening mates with the snorkel (it fits OVER the circular opening underneath the snorkel, not inside of it as some similar looking FE s-tubes do), and the smaller lower opening mates with a circular tube on the end of heat shield. 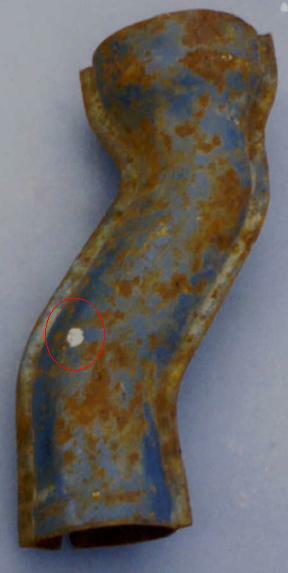 A small sheet metal screw is used to attach the s-tube to the heat shield; the screw mounts through the bottom of the s-tube in a small slot that's circled below in yellow. According to Allen Cross, there were two different s-tubes used on 428 CJs during their production run. The earlier s-tube is shown above. A later s-tube with a flared upper end (shown below) appears to have come into use at some point during the early part of the 1969 model year, though no service bulletin was ever issued to note the change. The change might have been made to provide more room where the s-tube mates to the snorkel, making it easier to fit these parts together and reducing the risk of damage during installation. Allen also notes that adapting this s-tube to KR Shelbys required turning it somewhat during installation, requiring punching of a new slot used to secure the s-tube to the heat shield. S-tubes with two or even three slots aren't uncommon as a third slot was sometimes cut to correct machining errors. 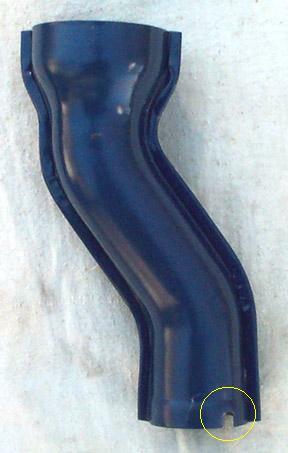 A reproduction S-tube fashioned after the early version is available from many vendors. Allen reports that the repro has wrinkles in places that the original doesn't, and it feels a little heavier -- perhaps because thicker steel or filler was used to produce the part. I've never seen any sort of engineering numbers formed or stamped onto these s-tubes. NOS versions usually have a sticker containing the part number attached along one side. If you're looking at a used part and are unsure if it's for a 428 CJ/SCJ you can identify the part by measurements: the larger upper opening is about 2 15/16" in diameter, the smaller lower opening is about 2 1/8" in diameter, and the tube is about 8 1/4" tall. I've received multiple reports saying that factory original s-tubes can be identified by a white paint daub as shown in this picture (the paint daub is circled in red).